1 August is the National Day in Switzerland, the 'let's not be beastly to the Austrians' day. Grilling (yo! ), fireworks (meh! ), speeches (oy vey! ), Wilhelm Tell and Walter (yeh!). Wilhelm Tell has been arrested for not being sufficiently reverential to a hat placed on a stick, the symbol of the Habsburg emperor's power. Gessler, the local Austrian Viceroy (Landvogt), forces Tell to shoot from a hundred paces an apple placed on his son Walter's head. If Tell refuses, both of them will be executed. Tell hits the apple on Walter's head and wins their freedom. As they are leaving, Gessler calls Tell back. Tell (Tell comes back) What is your wish, my lord? Gessler You stuck a second bolt in your jerkin – yes, yes, I saw it, alright. Why did you do that? Tell (embarrassed) My lord, that is the custom with archers. Gessler No, Tell, I don't accept that answer, it was done for some other reason. Speak the truth frankly and freely, Tell. Whatever it was, your life is guaranteed. Why the second bolt? Tell Very well, my Lord, since you have guaranteed my life I shall tell you the whole truth. (Tell takes the bolt from the jerkin and looks at the Viceroy with a terrible expression) With this second bolt I would have shot – you, if I had shot my dear child, and with that shot – believe me! I would not have missed. Gessler Well, Tell! I have guaranteed your life, I gave my word of honour and I shall keep it – But because I saw your malicious purpose, I shall have you taken away and imprisoned where neither moon nor sun shines on you, so that I am safe from your bolts. Guards! Seize him! Bind him! 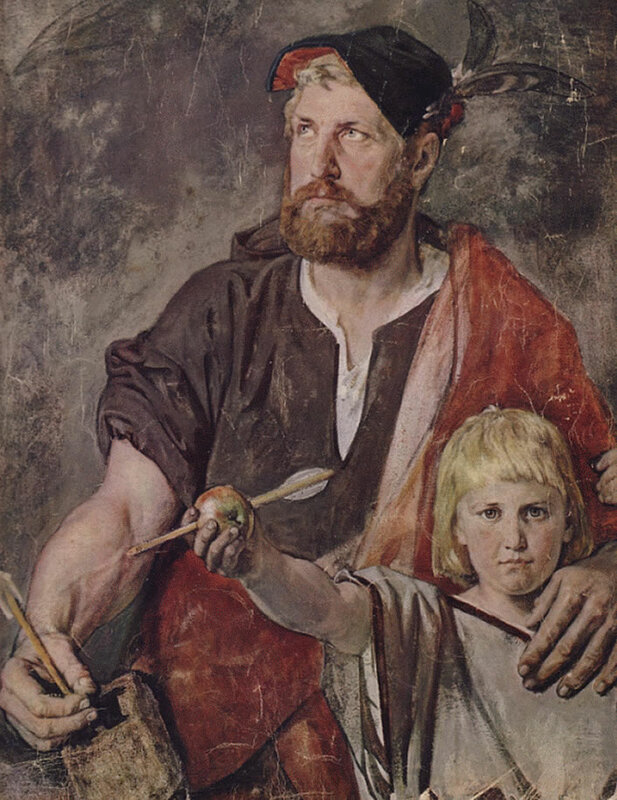 Ernst Stückelberg (1831-1903), Wilhelm Tell mit Sohn, colour sketch study for a detail for the frescos of the 'Tell Chapel'. Image: Öffentliche Kunstsammlung Basel. Stückelberg's draft is true to the details of Schiller's play Wilhelm Tell. The brave Walter has just run up ('springing') to his father: 'Father, here is the apple – I knew [you would do] it'. Stückelberg captures Walter proudly displaying the apple to us, the onlookers – what a wonderful expression on the boy's face! Tell is looking up at the mounted Gessler (outside this detail) with that 'terrible expression' when he admits the intention of the second bolt to Gessler, the bolt that we can see in Tell's right hand. The existence of this detail sketch of Stückelberg's shows the dramatic importance of this scene for the mural. As far as I know there are no professional photographs of the wall paintings in Tell's Chapel in the public domain, nor is Stückelberg's sketch easily accessible, unless you pay a Basel gallery an entrance fee. Disgraceful. Let's not get too outraged, though. Wilhelm Tell and Walter probably never existed, Schiller's play is fantasy. The chapel and all the other mythmaking that the Swiss did in the 19th century is just harmless fun, as long as you don't take any of it seriously.